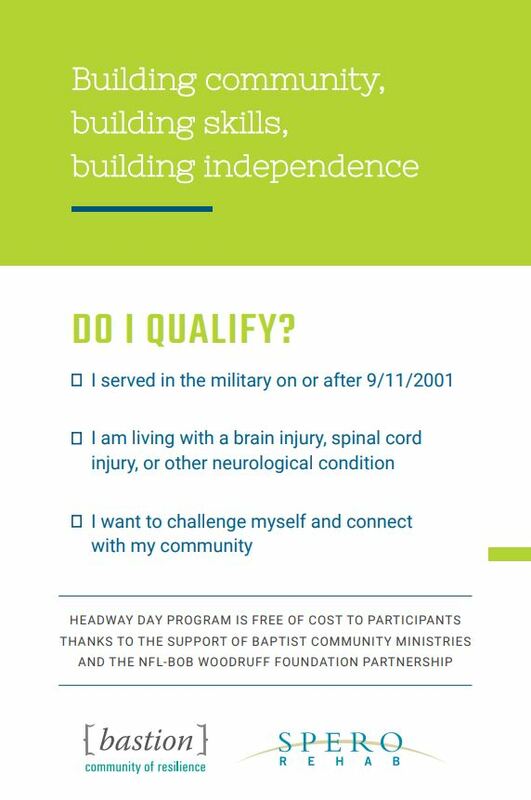 Made possible with support from Baptist Community Ministries and the NFL-Bob Woodruff Foundation Partnership, Headway is a two day per week program for veterans who served on or after 9/1/2001 and are living with a brain injury, spinal cord injury, or other neurological condition. This specialized community integration program for warriors and caregivers aims to maximize independence, improve skills, and build supportive networks. Participants have the opportunity to engage creatively, build practical skills, spend time in the community, participate in recreation and wellness activities, and more with fellow veterans weekly on Tuesdays and Thursdays. Family support members are invited to monthly respite events to support self-care. By participating in Headway, the entire veteran family unit will have new community supports to help them grow closer, happier, and healthier together. Complete the contact form below for more information. A staff member will reach out in approximately 1-2 business days. A staff member will reach out within approximately 1-2 business days.